This gal’s got some real balls. Is that too blue for you? Sorry, I just couldn’t resist such a nice opening. Oh, she’s got one of those too. Lest you think I’m being too irreverent, be advised that the protagonist of “Brahman/i: A One-Hijra Stand-Up Comedy Show” is frequently in your face about the uncommonly dual genitalia s/he possesses. 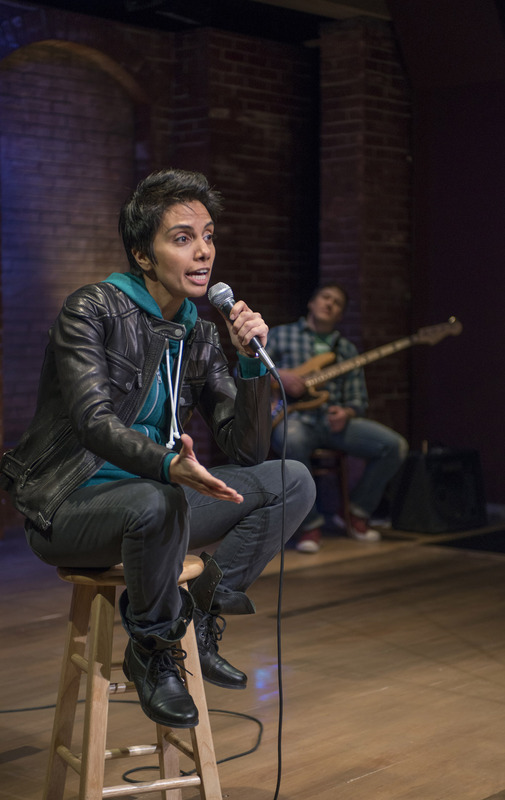 Portrayed by actress Fawzia Mirza in a commanding and at times fierce near-solo turn in About Face Theatre/Silk Road Rising’s downtown production, the titular character delights—like any good comedian—in confronting the audience. If you’re squeamish about anatomy or gender designations, be forewarned. And if you’re British, be prepared to bear the brunt of an increasingly fiery assault on your imperial history that surpasses even the abuse heaped upon Brahman/i’s sidekick, a hapless but sympathetic (and sympathizing) bass player who commits no less a sin than daring to sit, uncommitted, partly in the dark and partly in the spotlight reserved for the star. It’s Brahman/i who really straddles the line between dark and light, and so many other borders as well—at times making a case for understanding and tolerance, and at other times venting with a self-assured righteousness befitting one named after supreme, infinite reality. Also like the Hindu concept of Brahman, our hero in this play escapes gender classification. S/he flirts with such designation—and with some of the audience as well—but don’t expect any easy answers. Presented in the guise of stand-up comedy, writer Aditi Brennan Kapil’s entertaining, occasionally provocative show is a treatise on the intersections of personal and cultural boundaries—male/female, colonizer/colonized, history/mythology, science/superstition, nationhood/marriage, adolescence/adulthood—and much of it is wildly successful. If it deserves any demerits it’s for not always being funny enough for a show cloaked as standup. Just because the lead defies standard societal constraints doesn’t mean observations on high-school bullying or immigrant life aren’t at times overly familiar. They do however always serve the character and direction of the show. Nearly all the weaker humor is in the first part of the show, when through her tremendous performative skills and some simple but effective wardrobe, Mirza presents the intersex comic as an individual who chooses to live and identify as a boy. To say Mirza is convincing in this persona is an understatement; along with the perceived masculinity there is a vulnerability well-suited to one who is uncommitted to/unsure of any binary gender identity and is still in many ways a child. Though there is much made of Brahman/i’s refusal to pick a side, it is undeniable that once Mirza begins to portray the character as choosing to identify as a girl—and a woman—there is a marked strength and determination not seen earlier. About Face Theatre and Silk Road Rising at The Chicago Temple Building, 77 West Washington, (773)784-8565, aboutfacetheatre.com. $35. Through April 27.